Benign, solid, somewhat unstable, tumor of the left thyroid lobes, much like a goose egg in size. Larynx and head of the trachea pushed sharply to the right. Over the tumor one sees the powerful vast ven. jugular. externa. with its meandering estuaries. 62 year old rope maker. 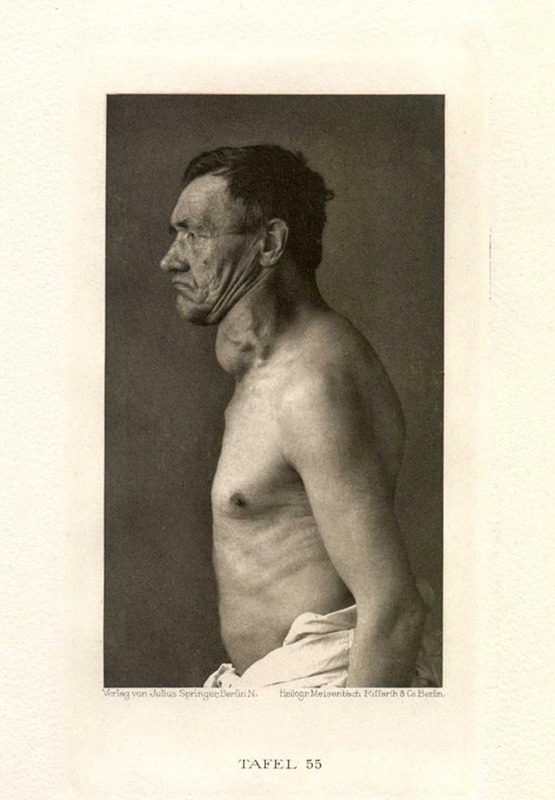 The goiter, which began to show itself in the 37th year of life and continued to grow from then on, of unknown origin. No heritability. Home and later whereabouts unsuspected. Patient, owing to an affilliated chronic bronchitis and emphysema, had no complaints from the gout.